If your restaurant is planning on opening for Thanksgiving dinner, the turkey and side dishes aren’t the only important things to consider. It is just as important that you offer some of the most popular desserts for the season. There are some great classics such as pumpkin pie and some newer desserts that are slowly becoming popular for the holidays. This guide will showcase some of the most delicious Thanksgiving desserts around, both the classics and the more creative ones. For most people the ultimate Thanksgiving dessert is a nice pumpkin pie. There are plenty of varieties available for this delicious dish. The most common version involves using canned pumpkin, but if your restaurant has the resources and the time, using fresh pumpkin will make a noticeable difference that your customers will be able to taste. You can also try adding some additional flavors to the pie for a new variation; including cardamom, chile or ginger. 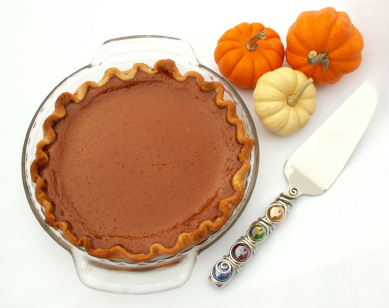 Although pumpkin pie is the classic Thanksgiving dessert, there are several others as well. Apple pie is a great option throughout the fall and winter, culminating during Thanksgiving. Apple pie is just as flexible as pumpkin pie; try adding pear, ginger, cardamom, cheddar or some spice to make a variation of this favored classic for your customers. Another great classic option for the season is a pecan pie. Depending on how many Thanksgiving reservations your restaurant has, you can decide to make several different pies and give your customers a choice. The most popular traditional food on Thanksgiving is definitely pumpkin and in addition to finding it in pies, it is also great in cheesecake. To add even more sweetness to pumpkin cheesecake, try making it with a brownie crust. This is ideal for restaurants as it can be made several days ahead of time, leaving Thanksgiving Day for making the main dishes. Another cheesecake option is to make individual portions. This will require more dishes, but it can still be made ahead of time. A great option for individual cheesecake is a salted caramel cheesecake, as it is both be creamy and delicious. Tarts are another great Thanksgiving dessert option and just like with pies, there are almost limitless options. They are a great alternative in addition to, or instead of, pies. Tarts go best with fruit fillings such as pear or apple, but there are plenty of other options as well. The great thing about tarts is that you and your chef can decide whether you want to make a giant tart and slice it or make small, individual ones. For a variation on a simple apple tart, try adding a bit of almond cream. Another option is to try a butternut squash tart; or other type of squash tart, and then try some of the classic fall flavors. Another great option for Thanksgiving dessert is a cake. Once again, the options are limitless. Your restaurant can serve something simple like a maple walnut cake or opt for a fancier pear and ginger upside-down cake. Either way, your customers will love the delicious results. If you are looking for a dessert that can easily seem fairly upscale, then mousse is one of your best options. Instead of going with the classic chocolate mousse, a great idea is to work in some of the favorite holiday foods. Try making it with butternut squash or pumpkin for some festive flavors. Another great upscale option is the Thanksgiving version of Tiramisu. Try using gingersnaps with Calvados syrup and pumpkin-mascarpone custard for a great holiday version of this Italian classic. This is another dish that can be made in advance, saving you time on Thanksgiving Day. If you want to offer special desserts for the children at your restaurant, there are plenty of ways that chefs can show off their creativity. Instead of serving plain cupcakes, you can dress them up to look like little turkeys. Try adding a bit of candy corn for the feathers, shortbread for the wings and head, and a dot of chocolate for the eyes. You can also make little pilgrim hat cookies by placing marshmallows on top of the shortbread cookies, melting chocolate on top and decorating them with some yellow frosting to make them look more like hats.